The first volume of Brian Clevinger and Scott Wegener's action comedy Atomic Robo has all the makings of a whip-smart, genre-savvy Saturday morning cartoon (back in the days when there were such things). Set in an alternate universe in which Nikola Tesla, rather than descending into death ray-devoted madness, built the world's first fully functional, Nazi-battling, wisecracking robotic man. Robo, armed with an indestructable body, an army of gun-toting geniuses (his "Action Scientist"), and a penchant for one-liners that would make Peter Parker jealous, takes on walking pyramids, disembodied scientists, and the creatures of the Vampire Dimension. I admit that action comics aren't usually my cup of cocoa, but Wegener infuses his action sequences with an absurd humor, much of which stems from the design of Robo himself. He neatly sidesteps the uncanny valley by making Robo adorably inhuman, but lets him convey a range of emotions with just his eyelids and his bearing. Wegener uses Robo's gracelessness to his advantage, tossing him through the air, shoving him to the ground, and knocking him about with clumsy zeal. And I dig that Robo is generally fully clothed, especially in his off-duty outfits of t-shirts and khakis. Most of issues involve Robo and the Action Scientists fighting some outlandish form of science-based evil, often in the form of Robo's key nemesis, Helsingard. These segments paint Robo as sci-fi's answer to Indiana Jones and are packed with Clevinger's awesome Action Science banter (there's a great running joke about the study of "imaginary science"). It is, as I said, the perfect setup for a TV serial. But I strongly suspect that, had there been one more such sequence in the volume, I might have tired of the whole action team business. I tend to prefer the stories that delve into Robo's personal history, such as the time he was stuck on a two year-long trip to Mars with almost no reading material, thanks to a scheming Stephen Hawking, or the time Thomas Edison summoned the ghost of Grigori Rasputin to assassinate his rival's robotic offspring. I haven't yet picked up the Robo Volume Two trade, but I hope we get to see a bit more of Robo's day-to-day, non-world-saving life. In one of the early first volume stories, Robo tells a reporter, "The hardest part? The hardest part is that I'm 83 years old. I do a great Jack Benny, but no one really gets it any more." Funny robots are great, but it's nice to see a wistful one every now and then. 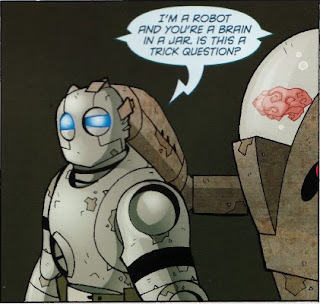 Anyone got a clue on where I can score an Atomic Robo t-shirt? I passed up on one at a comic con and instantly regretted it. You can grab them at the Secret Bunker store online. They also sell Buffalo Soldier shirts from my pal Jorge Vega's excellent book Gunplay. Gisèle Lagacé's "Ménage à 3"